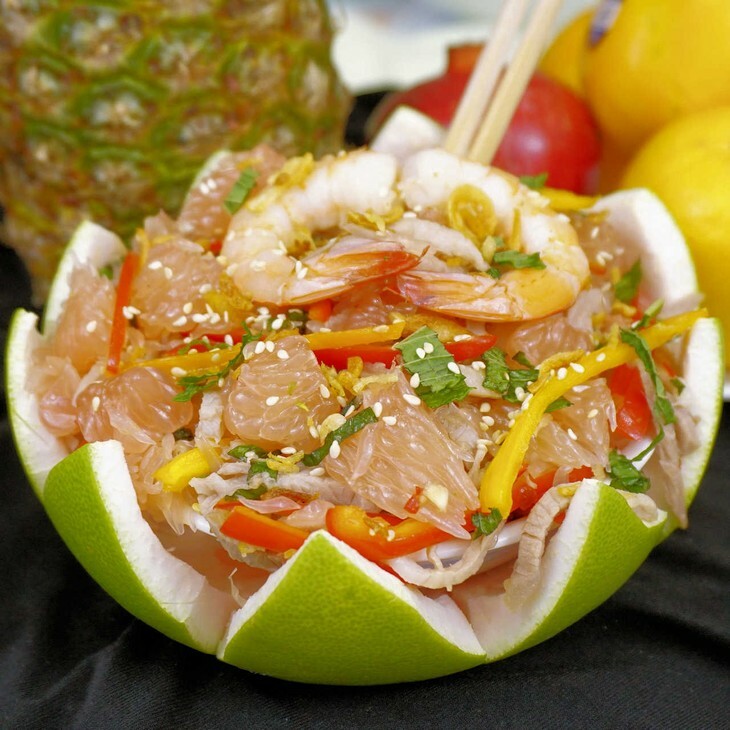 (VOVWORLD) - “Pomelo with shredded chicken and prawn salad” is nourishing and delicious, helping you realize your weight loss goals.This is a truly refreshing and delicious salad, with the amazing freshness of the juicy pomelo combining with the cripsy shrimp, tender shredded chicken and the subtle flavor of herbs. A: This is Food Delight, bringing you tips and recipes to enliven your daily menu. We’re A and B. B: In today’s segment, we’ll introduce you the recipe for “Pomelo with shredded chicken and prawn salad” by Nguyen Thuong Quan, or Chef Rice, chairman of the Vietnam Chefs Association. A: The salad is one of my favorite healthy recipes for lunch. I love biting a juicy pomelo , the fishy prawn, and tender chicken. The mixture is so tasty. B: Agreed. This healthy salad recipe is nourishing and delicious, helping you realize your weight loss goals. All the ingredients can be easily found in any grocery, and the process is simple, so I think anyone can cook it. A: When waiting for the chicken and prawns to cool down, we prepare the pomelo. The pomelo skin is thick, significantly thicker than the skin of a lime, or an orange. If you find it’s hard to peel a pomelo like I do, you can buy peeled ones for convenience. B: You can get your kids or family members involved by letting them separate the flesh into bite-sized pieces and deposit them in a bowl. One pomelo is enough for a family of four. 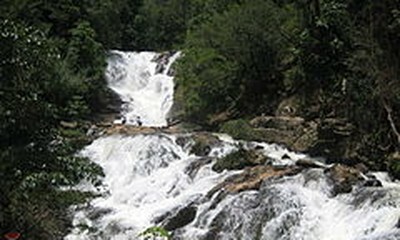 A: When all ingredients are ready, Chef Rice teaches us how to make the dressing: “For the dressing, combine water, sugar, lime juice, fish sauce, chopped chilis and garlic in a small bowl and stir to dissolve the sugar. 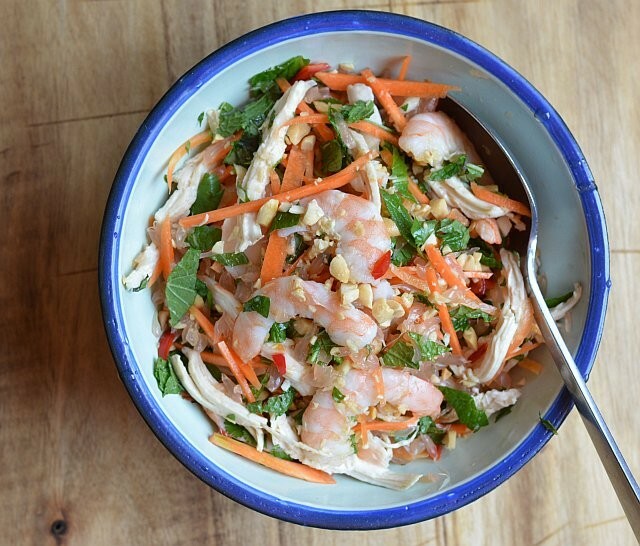 Right before serving, add all ingredients: the shrimp, chicken, carrots, mint, cilantro, peanuts and shallots to the pomelo. Add the dressing and toss well, adjusting the flavors to your taste. Arrange the salad in a plate and serve with fried prawn crackers.”, Chef Rice said. B: For this dish, you will need to adjust the dressing flavor according to the sweetness and sourness of the pomelo. If the pomelo is quite sour or tart, use more sugar and less lime juice. A: I suggest you start with about half of what the recipe calls for, and then adjust the ingredients to taste. B: This is a truly refreshing and delicious salad, with the amazing freshness of the juicy pomelo combining with the cripsy shrimp, tender shredded chicken and the subtle flavor of herbs. If you make this dish, share your photo on Facebook and tag us at VOV5 English Service, hashtag VOV#FOODDELIGHT#ICANCOOK#. We’d love to see what you come up with. Cheers, friends!